Publisher: T. Fisher Unwin. Country: United Kingdom. Date: c. 1887. Publisher: G. P. Putnam's Sons. Country: United States. Date: c. 1887. London, T. Fisher Unwin, 1890 (The Story of Nations). Hardback. 376 pages. Green cloth boards. Black, red-brown and gilt text and illustrations on front panel and on spine. Black and white frontispiece and 43 in-text black and white illustrations. Two fold-out maps. Protective tissue on frontispiece. Index. Publisher's advertisements in final pages. Series Note: "The plan of this Series is to present, in graphic narratives, prepared by competent historians, the stories of different nations that have attained prominence in history. While it has not proved practicable to issue the different volumes in the their chronological order, their subjects have been planned to cover consecutive or connecting periods, so that the set when completed will present in one comprehensive narrative the epoch-making events in the great Story of the Nations. The Times has spoken of it as "that useful series,' The Spectator has called it "an excellent series"; while The Pall Mall Gazette says "it is likely to be found indispensible in every school library." Format: "Crown 8vo [octavo], illustrated, and furnished with Maps and Indexes, price 5s. each." 1. Rome: From the Earliest Times to the End of the Republic - Arthur Gilman, M.A. 2. The Jews: In Ancient, Mediaeval, and Modern Times - Prof. J. K. Hosmer [James Kendall Hosmer]. 4. Carthage - Professor Alfred J. Church [Alfred John Church]. 5. 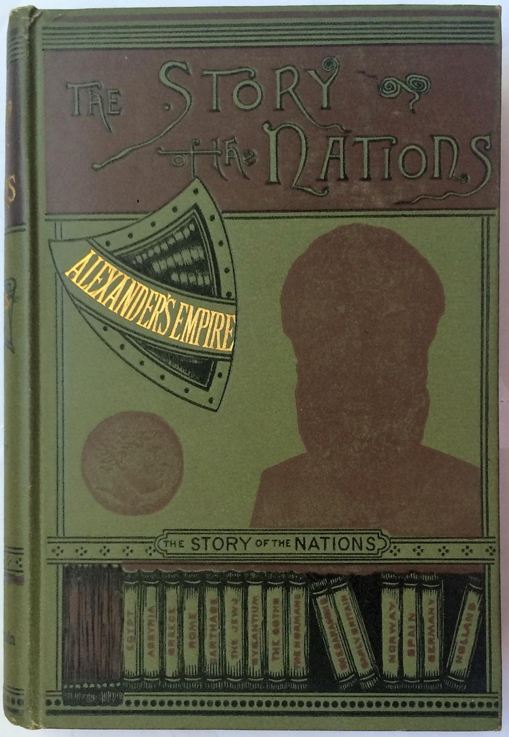 Alexander's Empire - Professor J. P. Mahaffy [John Pentland Mahaffy]. 6. The Moors in Spain - Stanley Lane-Pool. 7. Ancient Egypt - Professor George Rawlinson. 8. Hungary - Professor Arminius Vambéry. 9. The Saracens: From the Earliest Times to the Fall of Baghdad - Arthur Gilman, M.A. 10. Ireland - The Hon. Emily Lawless, author of Hurrish: A Study, &c. With additions by Mrs. Arthur Bronson. 11. Chaldea: From the Earliest Times to the Rise of Assyria - Zenaide A. Ragozin. 12. The Goths - Henry Bradley. 13. Assyria - Zenaide Ragozin. 14. Turkey - Stanley Lane-Poole, author of The Moors in Spain, &c.
15. Holland - James E. T. Rogers. 16. Mediaeval France - Gustave Masson. 1888. 17. Persia - Samuel Greene Wheeler Benjamin. 1887. 18. Phoenicia - George Rawlinson. 19. Media, Babylon and Persia - Zenaide Ragozin. 1888. 20. The Hansa Towns - Helen Zimmern. 1891. 21. Early Britain - Alfred John Church. 22. The Barbary Corsairs - Stanley Lane-Poole. 1890. 23. Russia - William Richard Morfill. 24. The Jews under Roman Rule - William Douglas Morrison. 25. Scotland - John Mackintosh (18331907). 1890. 26. Switzerland - Lina Hug. 27. Mexico - Susan Hale. 28. Portugal - Henry Morse Stephens. 29. The Story of the Normans - Sarah Orne Jewett. 30. Byzantine Empire - Charles Oman. 31. Sicily - Edward A. Freeman. 32. The Tuscan Republics - Bella Duffy. 33. Poland - William Richard Morfill. 34. Parthia - George Rawlinson. 35. Australian Commonwealth - Greville Tregarthen. 36. Spain: From the Moorish Conquest to the Fall of Granada (711-1492, A.D.) - Henry Edward Watts. 1893. 37. Japan - David Murray. 38. South Africa - George McCall Theal. 1894. 39. Venice - Alethea Wiel. 40. The Crusades - T. A. Archer / Charles Lethbridge Kingsford. 41. Vedic India - Zenaide Ragozin. 42. West Indies and the Spanish Main - James Rodway. 43. Bohemia - C. Edmund Maurice. 44. The Balkans - William Miller. 45. Canada - John George Bourinot. 1896. 46. British India - Robert Watson Frazer. 47. Modern France - André Le Bon. 48. The Franks - Lewis Sergeant. 49. Austria - Sidney Whitman. 50. Modern England before the Reform Bill - Justin McCarthy. 1898. 51. China - Robert Kennaway Douglas. 1899. 52. Modern England from the Reform Bill to the Present Time - Justin McCarthy. 53. Modern Spain 17881898 - Martin Andrew Sharp Hume. 54. Modern Italy - Pietro Orsi. 55. Norway - Hjalmar Hjorth Boyesen. 56. Wales - Owen Morgan Edwards. 1901. 57. Mediaeval Rome - William Miller. 58. The Papal Monarchy - William Francis Barry. 59. Medieval India under Mohammedan Rule - Stanley Lane-Poole. 1903. 60. Buddhist India - Thomas William Rhys Davids. 1903. 61. Parliamentary England - Edward Jenks. 62. Mediaeval England - Mary Bateson. 1903. 63. The Coming of Parliament - Lionel Cecil Jane. 64. The Story of Greece, From the Coming of the Hellenes to A.D. 14 - Evelyn Shirley Shuckburgh. 1905. 65. The Roman Empire, B.C. 29A.D. 476 - Henry Stuart Jones. 1908.